I've really been trying hard to eat healthy for the last few weeks. I've had cauliflower... on purpose...more than once this week. (Which...actually is not much of an accomplishment because I actually like it. But if you hated cauliflower, then that would have sounds super impressive, right?) I've reduced my sugar intake by brushing my teeth before making cookie dough. I estimate that this act alone has reduced my sugar calories by half. I'd love to lie to you and tell you that I've changed my sugar-dependent ways and that this was all in search of a healthier me and a better future and all those fantastic things that people say (and I would never mean), but the truth is -- Spring is coming. And with it... CADBURY EGG SEASON!!! I've got to make room now because this year -- I am accepting the challenge. I'm not exactly sure what this "challenge" is necessarily... but if it has to do with Cadbury mini eggs then I AM IN. I am in sideways and doubles and Fridays and Saturdays. So... back to the afternoons where I'm wasting away NOT eating cookie dough and looking longingly at my children's Valentine candy and for some reason, some parent bought DOVE CHOCOLATES for their 5 year old to give to other 5 year olds as if they would have any appreciation for chocolate that is not shaped like a princess or a super hero. And then I was feeling bad because that chocolate will never be loved like it should be loved. And when you think about it, that's pretty sad. Every chocolate deserves to be in a home where it will be truly loved. And I'm a lover at heart, so I mean... I *HAD* to eat it. You know...for the greater good and all. I waited until all of my children were out of the room so there would be no witness to my sugar consumption and I opened the wrapper like my life depended on nobody hearing it. And I glanced at the wrapper, absolutely positive that it would justify my dalliance with sugar. And I KID YOU NOT... it said, "Exercise." Sure, it was then followed by "your love." But I don't care. The word exercise has no business being on a chocolate wrapper! How am I supposed to come back from that kind of afternoon-chocolate-guilt?! This set me back WEEKS of emotional preparation!! 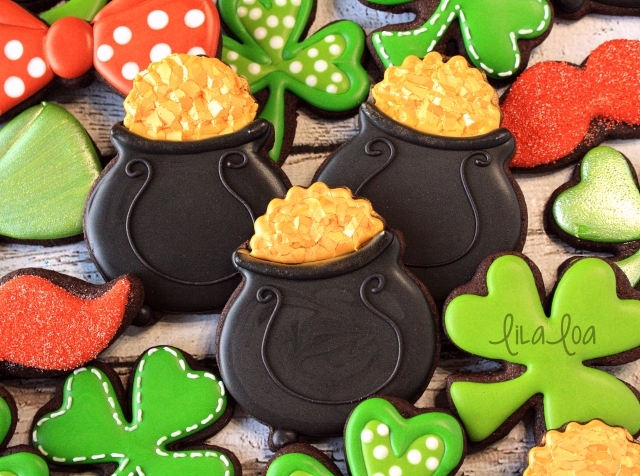 I've got quite a bit of training to get in to make up for this little "incident" so I decided to take the easy way out with these pot of gold cookies. Want to see? 1. To start with, I cut into the top of a cauldron cut-out with a scalloped round and replaced the bit I took out with an entire scalloped round before baking. 2. Outline and fill the cauldron area with medium consistency black icing. Let it dry for an hour at least. 3. Outline and fill the gold area with... ummm... gold icing. It doesn't have to be super smooth. Give it about 10 minutes in a dehydrator or 25 minutes at room temperature before moving on to the next step. 5. Pipe a thick rim for the cauldron and 2 dots of icing for the legs with the black icing and a #3 tip. 6. Put a #1.5 tip on your black icing and pipe a handle for the cauldron. 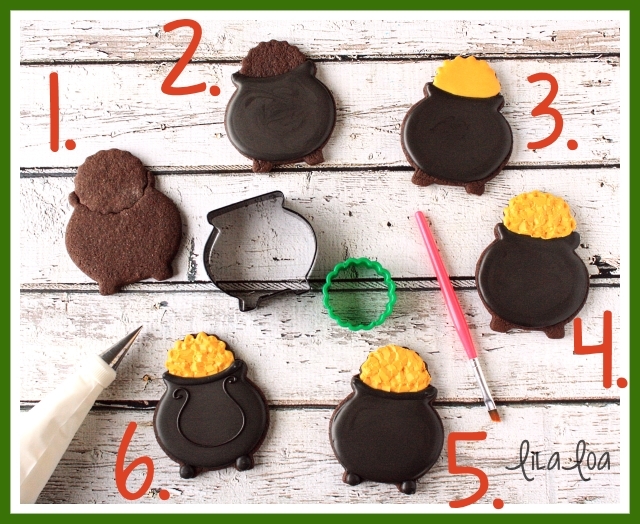 Some variations-- You could sprinkle gold sanding sugar on the gold icing immediately after piping it. Or you could paint the gold with gold airbrush or luster dust after it sets to get truly gold pots of gold. Here is a video to show you the mooshing step...you know... in case you need it. Find a simple leprechaun tutorial HERE. 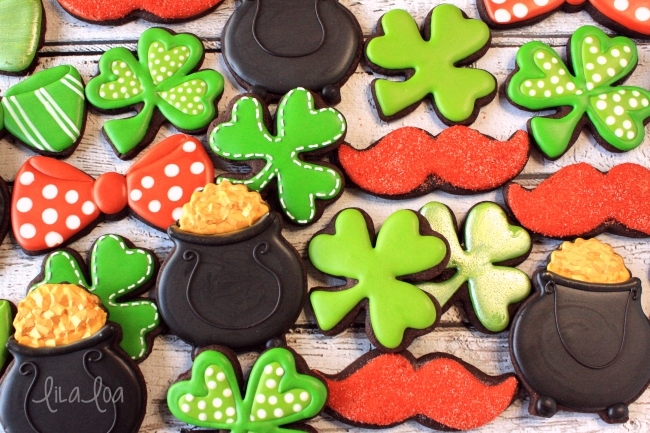 Make some fun Leprechaun Loot cookies with THIS tutorial.